If you are renovating, you may have come across Wood Doors with Wrought Iron Houston. There are many options available when it comes to choosing a door. It is important to consider all factors when making this decision. The right style of door for your home will improve its look. The wrong one will can make your entryway unwelcoming. Consumers should also focus on the supplier as well as the style. You want to be sure the vendor is there to fix the problem if something goes wrong. Thinking about the look of the door and the vendor will help you find the perfect door. It is also important to consider the materials used. Not all wood and wrought iron entry doors are the same. Some may use subpar materials or an inferior design. These doors will not last as long and will cause more problems. Customers should always ask about the material used when shopping for doors of this type. Customers looking for wood doors with wrought iron inserts can visit Southern Front. Southern Front Stained Glass and Doors carries many interior and exterior designs. They have a wide selection for customers to browse in store. You can also visit Southern Front online at http://www.southernfront.com/. If you are looking for more information, you can also call them at 291-890-5860. Take a look at the buying tips below, and then call Southern Front to see their wrought iron doors. When buying a major item for your home, you want to be sure it will last. This is especially true when it comes to your front door. The first impression visitors have of your home is of its entryway. As such, you want to be sure it is as appealing as possible. Choosing wood and wrought iron entry doors in a style you love is a great start. Avoid the temptation to rush the decision. While you may have a lot to do, this is an important decision that needs your attention. As you are browsing for new doors, be sure to look for patterns and styles that are timeless. A modern or trendy design or flourish might look good now. Unfortunately, these trends usually pass by quite fast. You do not want to be stuck with a door that looks dated and old before its time. Keep your own preferences in mind as well. It is important that you come home with a door you can live with for years to come. Southern Front Stained Glass and Doors has a wide selection for you to browse through. You can visit them in person or online at http://www.southernfront.com/. They offer thousands of styles and patterns, with many material combinations. If you do not find the style you had in mind, speak with a customer service representative. You can call Southern Front at 291-890-5860 to ask about custom options. Southern Front wants all their customers to love their homes. Helping you find the perfect door goes a long way to achieving that goal. Once you find a style you love, you need to examine the materials used to make it. Not all wood doors with wrought iron inserts use the same quality of material. Some types of wood will deteriorate faster than others. The thickness of the wrought iron will also play a part in determining the door’s quality. Ask about the exact materials each door uses if the information is not clear. Lower quality materials will result in a door that needs replacing much sooner. The type of maintenance needed to keep the door looking new will depend on the materials used. Be sure to ask the sales representative about proper cleaning and maintenance. A good time to do so is when you are already asking about the door’s composition. While warm water is perfect for wrought iron, it can cause some wood to warp. Avoid unintentional damage by asking about cleaning and maintenance now. You can find high quality doors at Southern Front Stained Glass and Doors. Southern Front only uses the best materials for their wood and wrought iron doors. You can trust that your door will last if you buy it from Southern Front. Interested customers can visit Southern Front online at http://www.southernfront.com/. You can also contact them by calling 291-890-5860. They are happy to help you find the perfect, high quality door. Sales staff will also tell you the best way to keep your door looking like new. Researching the vendor is important when you are shopping for wrought iron doors in Houston. A disreputable vendor will sell you lower quality products. They will not be there if something goes wrong. As a result, you may wind up with high replacement costs. It is much easier, and less costly, to find a recommended local company. Search for one with references from local home builder’s associations. These companies have proven that their products are of the highest quality. You can also rely on these companies to have a customer service department you can contact if anything goes wrong. There are other benefits to using an established vendor. They often have a wider selection of doors made with a variety of materials. These companies can usually make custom doors as well, giving you even more choice. Start by searching online, but always contact the company by phone before buying. A short conversation with customer service can go a long way. If it does not go well, you know to move on and call another vendor. Southern Front Stained Glass and Doors has a wide selection of doors. They sell to customers across the country and have for many years. 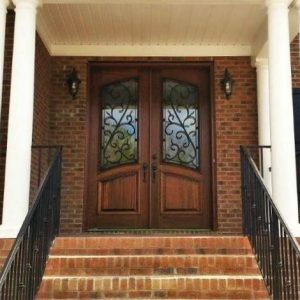 You can count on Southern Front to supply only the best wrought iron and wood doors. Southern Front can also custom make your order if you do not find a style you like. Visit Southern Front online at http://www.southernfront.com/. You can call Southern Front at 291-890-5860. Keeping these tips in mind will help you find the best wrought iron doors in Houston. Remember to take your time when you are selecting a new door. Your front door is the first thing you notice about your home. If you pick one you do not like, it could ruin your entryway altogether. Be selfish and pick a design you love. Southern Front Stained Glass and Doors sells high quality wrought iron doors. They serve customers in Houston as well as across the country. Southern Front can even ship to Canada. You can visit Southern Front online at http://www.southernfront.com/. You can also contact Southern Front by calling 291-890-5860. Southern Front is your first choice for wood doors with wrought iron Houston.